Whether you're a newcomer to Vancouver or just visiting, getting around Vancouver can seem confusing at first. How do you use Vancouver Public Transportation? What are the best options for getting where you need to go? How do you pay for tickets? This quick guide to Vancouver Public Transportation will answer all your questions and help you find the best way to get where you're going fast. There are also tips and smartphone apps to help you use Vancouver Public Transportation more efficiently, plus information on using public transit to travel around British Columbia. All Vancouver Public Transportation is run by TransLink, the Metro Vancouver transportation authority. TransLink operates a variety of public transportation options in Vancouver and tickets are good across buses, Skytrains and the SeaBus. Most people use the Canada Line & SkyTrain Rapid Transit when visiting the city, especially the Canada Line. Vancouver's rapid transit runs north-south from the Vancouver Airport to Waterfront Station in Downtown Vancouver and west-east/southeast from Waterfront Station to Burnaby and Coquitlam. Compass Cards are available online, by phone and at all SeaBus, West Coast Express and SkyTrain Station Compass Vending Machines. They are also available at Compass Vending Machines at London Drugs locations. It's still possible to pay with cash on buses but exact change is needed. Tap in when you enter a bus or any Skytrain/SeaBus station and out again at Skytrain stations (not buses). Each fare covers a 90-minute journey on the bus, SkyTrain, and SeaBus. The city and suburbs are split into three zones. SkyTrain and SeaBus rides require a 1-, 2-, or 3-Zone fare, depending on the time of day and zones traveled. Buses are a one-zone fare, all day, every day. Cash fares on buses are not transferable to SkyTrain, West Coast Express, or SeaBus. All journeys starting after 6:30 p.m. (weekdays) and all day on weekends and holidays, across the entire Metro Vancouver region, are a 1-Zone fare. Adult fares are $2.95 for one zone, $4.20 for two, and $5.70 for three. SeaBuses: SeaBuses carry passengers to and from Waterfront Station in Downtown Vancouver to North Vancouver's Lonsdale Quay. 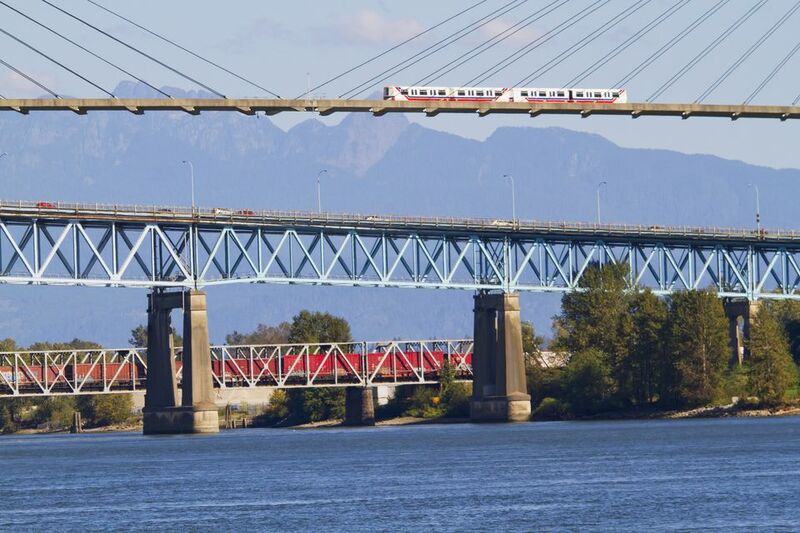 West Coast Express: This commuter rail service transports people from Downtown Vancouver to Mission, BC. Mobi: Vancouver is a very bike-friendly place and you can rent one from one of the many bike rental places on Davie/Denman or pick up a Mobi bike share to take a trip around the Seawall. You can bring your bike on all Vancouver Public Transportation options, including buses, Canada Line/SkyTrain rapid transit, and SeaBuses. All buses are equipped with bike racks. Taxis do not always show up for bookings but there is no Uber or car share platform in the city apart from self-drive Evos or Car2Gos. Transit is not 24 hours a day so check your trip beforehand. Downtown is walkable but transit is a good way to get to Kitsilano, Commercial Drive and the North Shore (including Grouse Mountain). If you want to travel outside Metro Vancouver — for example, if you wanted to take a day trip to Whistler — and still use public transportation, you can plan your trip with BC Transit. BC Transit is the provincial crown agency charged with coordinating public transportation throughout British Columbia (outside the Greater Vancouver Regional District). There are many wonderful island destinations near Vancouver, including Vancouver Island/Victoria and Bowen Island. The public ferries that operate between the Mainland (i.e., Vancouver) and the various islands and coastal regions of BC are operated by BC Ferries. You can find ferry schedules and directions to departure ferry terminals for trips from Vancouver to Vancouver Island and the Sunshine Coast. Remember: You can use Vancouver Public Transportation/TransLink to reach any ferry terminal. Simply use the name of the ferry terminal as your destination in the online TransLink Trip Planner or TransLink Mobile App. What Is Vancouver Like in March?